(Photo: Reuters / Stefano Rellandini)Pope Francis hugs a child as he arrives to lead the weekly audience in Saint Peter's Square at the Vatican June 19, 2013. Pope Francis has issued a warning to church officials against being hypocrites during a Mass on Thursday. The warning was issued as he said Mass before two Vatican offices attending his morning Mass. "Inconsistency on the part of pastors and the faithful between what they say and what they do, between word and manner of life, is undermining the Church's credibility," Francis said in his homily. "Those who listen to us and observe us must be able to see in our actions what they hear from our lips, and so give glory to God." Vatican Radio reported that he celebrated the Mass at the Saint Martha House alongside the heads of the Congregation and the Council, which include Cardinal Marc Ouellet, Archbishop Lorenzo Baldisseri, Archbishop Vincenzo Paglia and Bishop Jean Lafitte. "We think about the hypocrisy in the Church and how bad it makes all of us," Francis, who is the Bishop of Rome told members of the Congregation of Bishops and of the Pontifical Council of the Family. "These do not know beauty, they do not know love, these do not know the truth. They are small, cowardly," the pontiff said. Pope Francis has set up an advisory body of cardinals to help him govern the Church and reform its administration which faced accusations of cronyism and infighting under Benedict XVI. 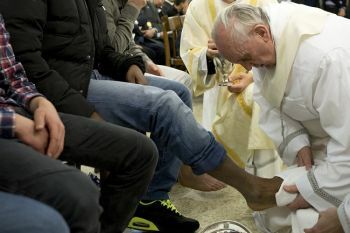 (Photo: L'Ossevatore Romano)Pope Francis washes the foot of a young man at the Casal del Marmo juvenile detention center in Rome on Thursday, March 28, 2013. The pontiff said Christianity is not simply the study of laws or commands as this impedes understanding and living the truth that God has joy and generosity. The Pope reflected on the famous passage of Matthew's Gospel that contrasts the behaviour of the scribes and Pharisees - who make a show of praying, fasting, and almsgiving - with the path indicated by Jesus. In this he shows his disciples the proper attitude to assume in the same circumstances: giving alms and praying "in secret." Pope Francis criticized not only the vanity of the scribes and Pharisees, but also those who impose "so many precepts on the faithful." 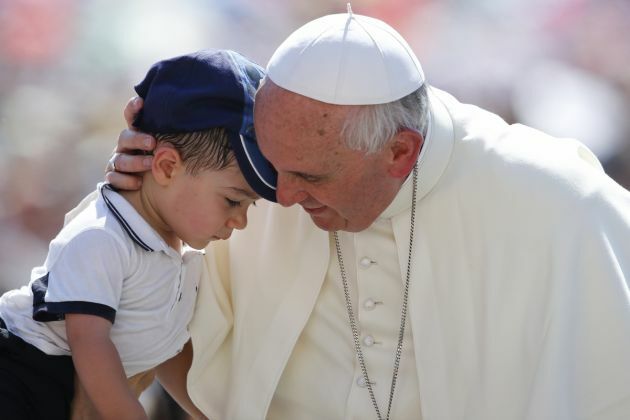 The Argentine Pope has impressed many of the Catholic faithful and outsiders with his humility and simple lifes tyle.